One of our regular clients has decided to add another market to his project portfolio. This new location is the Adirondack mountains in the United States. 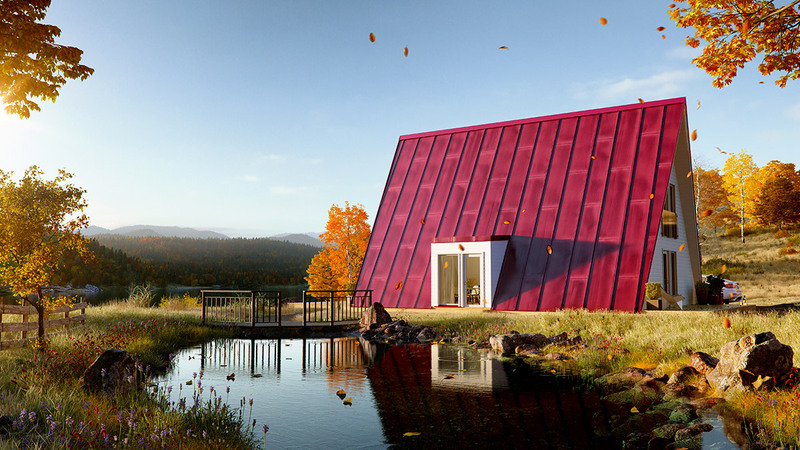 This happened after we created images for his new product: A-shaped houses. I have already mentioned in our previous case study that our client has made a whole new company under a whole new brand. Now, he has become a newcomer in the US wooden house market. 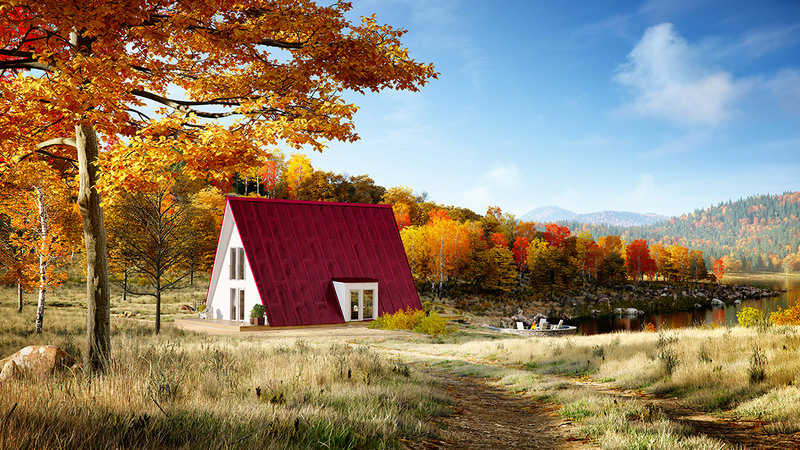 Typically, the US wooden house market is a very crowded one with very high competition. That means that our client cannot enter this market if his 3D images are plain-looking. No one would even pay attention to him. Like I explained in the article - Storytelling through 3D Images, the only way to catch people’s attention is by captivating specific emotions that are linked to an unforgettable memory. 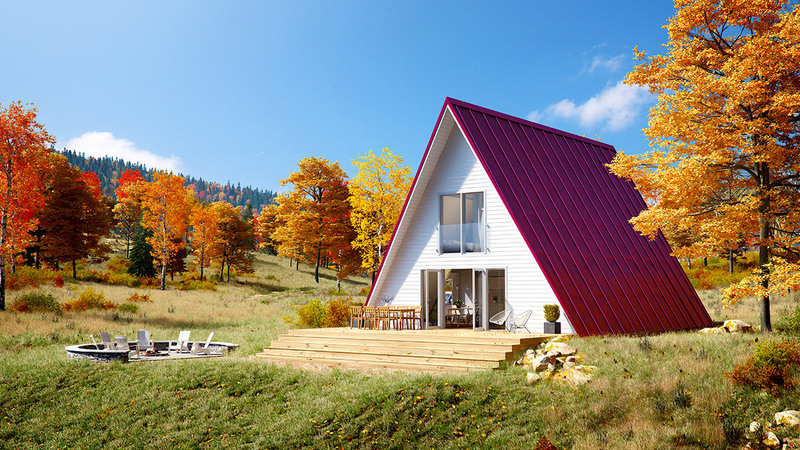 As such, our client needs something really interesting and exciting that can connect him with the people living in this particular area. These people are the client’s potential buyers of his A-shape houses. The client turned to us knowing that we could help him achieve his goal. The projects we made not only create some captivating images, but they also tell a story. Those images we created convey a story that could touch the deepest human emotions. From the information above, we can conclude that it is impossible to create something unique and stunning which will captivate a potential buyer’s attention. 5. Can we do better? From the information above, we can conclude that it is impossible to create something unique and stunning which will captivate a potential buyer’s attention. With the ideas presented, the result would be another set of ‘sunny’ images which won’t stand out from the crowd. In order to turn the tables and create a captivating final output, the only sensible thing to do is to have a roadmapping session. A roadmapping session is a brief, strategic, result-focused meeting between the service provider and the client (in case you have no idea what it is). During this session, we reviewed our client’s desired outcome for the project, considered any possible barriers to achieving success, and set expectations on how things would turn out. The first thing we did was a Mood board intended to project inspiration and emotion through images. 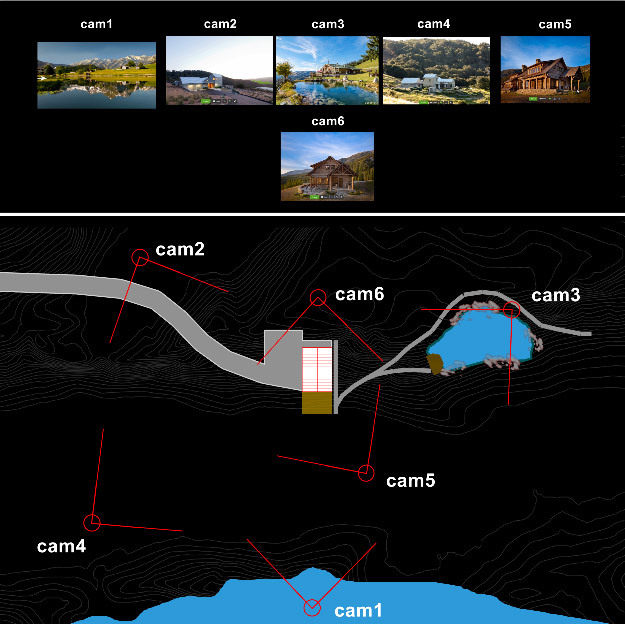 After some thorough considerations, we highlighted some images which reflect most of the client’s ideas. Based on the images selected, we proposed two ways of telling a story through images to the client. 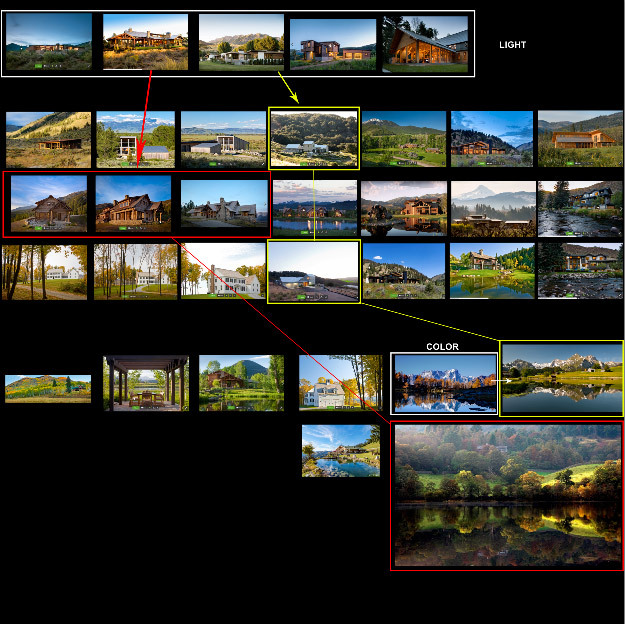 These are shown by the red and yellow highlighted images shown below. Also, almost all clients make the same mistakes over and over again. They completely forget and even omit the aspect of emotions and storytelling and focus only on building’s details, which are in most cases disregarded by vast majority of public. And this is very pity. 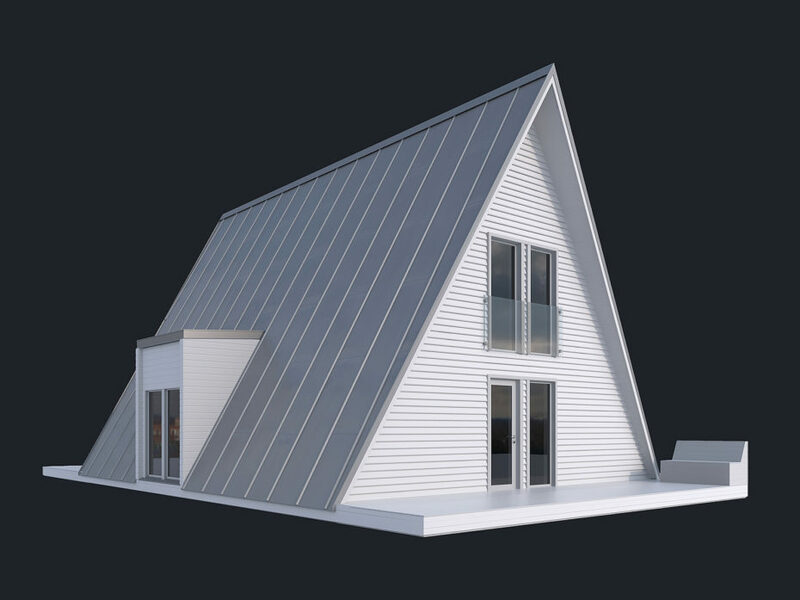 Architects order 3D services a lot. And looking from an architect’s perspective, I believe that he wanted to show his best works on the building he created; the problem is, to whom does he want to show his work? His potential customers would not be interested in those tiny technical details unless they are also architects themselves. 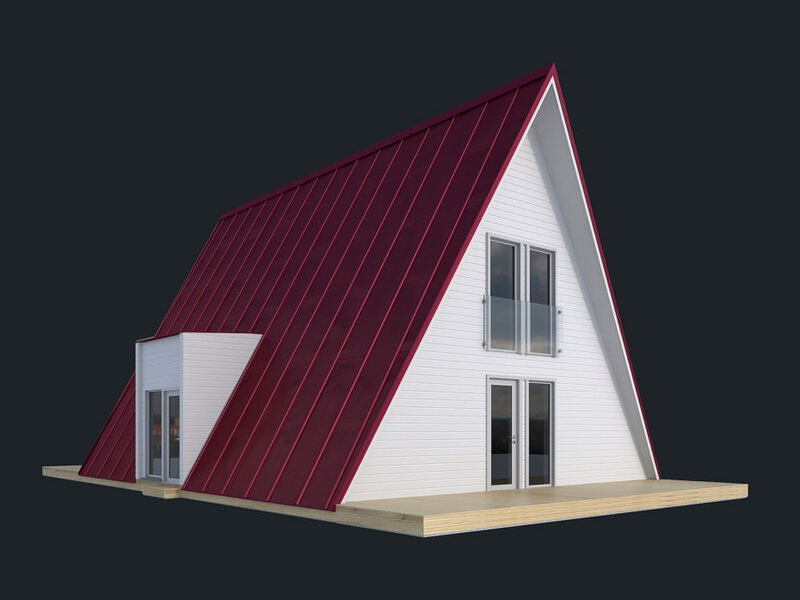 Therefore, clients should leave these things in the hands of 3D studios because they are experts in that field. They know what to do. They know how to tell the right story. They know how to convey your thoughts. It’s something they do every day after all. 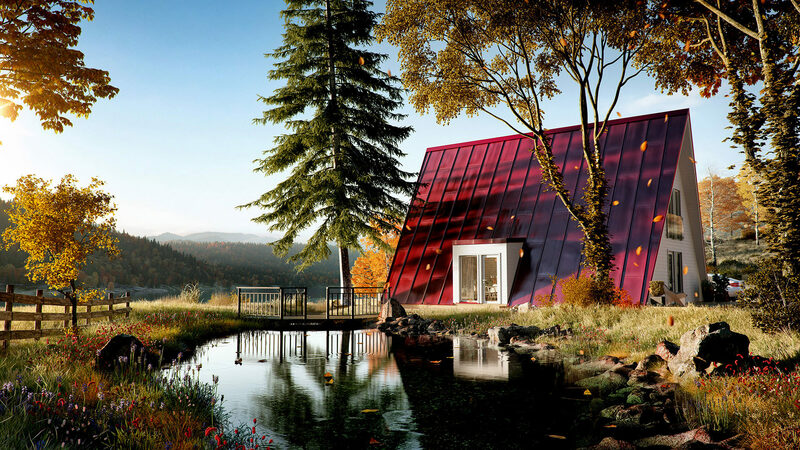 Architects should keep their hands off the smaller details and only give their opinion on how they want the general output to look like. I will only show you an overview of how we work. 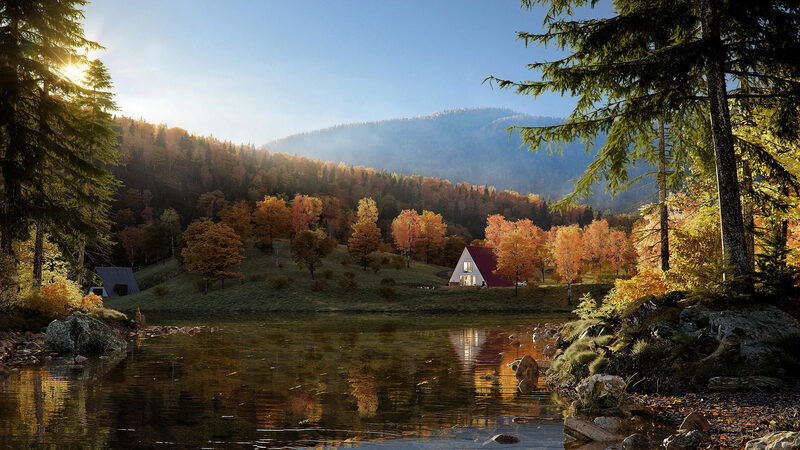 The most important part of architectural 3D visualization that creates the mood is the surroundings. The building is often left untouched as the colors are preset by the architects. By spending more time on the surroundings, we can create a better-looking output. 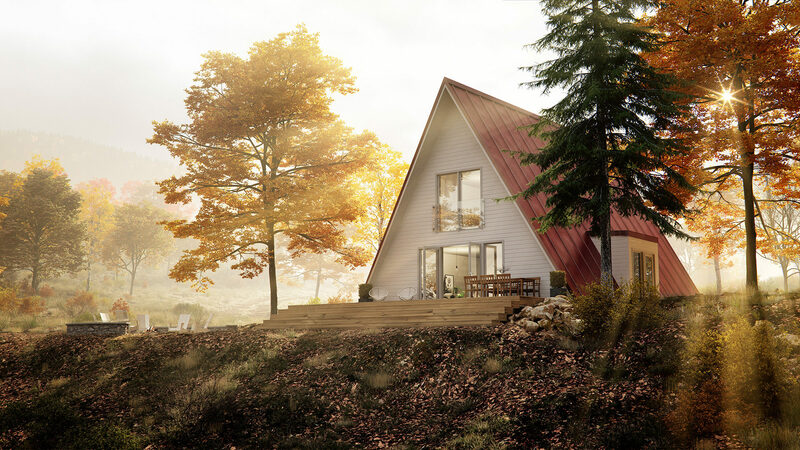 Here is an initial render for the Adirondack mountains and some pre-final images. Field of view – 10km. We used a lot of tools to make such landscape with vegetation. 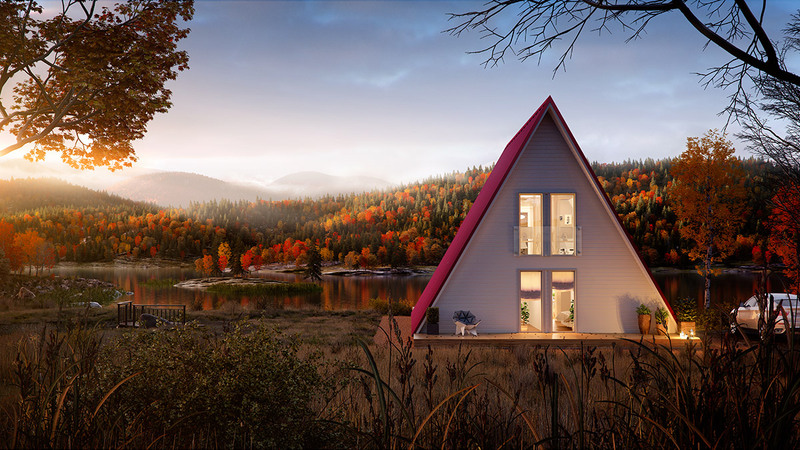 These include 3Ds Max and Multiscatter plugin, Zbrush and Terrain Tools plugin, and more. This section is technical, so if you’re not familiar with the terms involved, you may ignore this. But if you’re interested and would like to order similar projects, reading this section will give you an insight as to how difficult the technical part gets. The first problem is rendering. Each computer can only render only a portion of the image. They are then combined for post-production - something that is very time-consuming. “Hollywood style”. This means that the computer has to render the foreground, middle ground, and background individually then we should manually combine them into a single image later. Time-consuming as well. Each of our computers has 32GB RAM. This was not enough. To hasten our pace, we decided to upgrade each computer’s memory to 64GB. Note: server memory costs way more than an ordinary computer memory. Only after upgrading our systems we’re able to continue working. The second problem: additions and changes. There’s not really a problem with having an idea and to be true it’s really good if a client suggesting ideas, but only in case if he is not insisting on them. And here most studios do a common mistake – they agree on applying changes without proper discussion. And here I admit – we did the same mistake by applying changes suggested by the client even if we were not really agreeing with him. The third problem is the storytelling and emotions. I accept that this is probably the most difficult one because even if we already created a Mood board which was very helpful, we still missed some finer details. 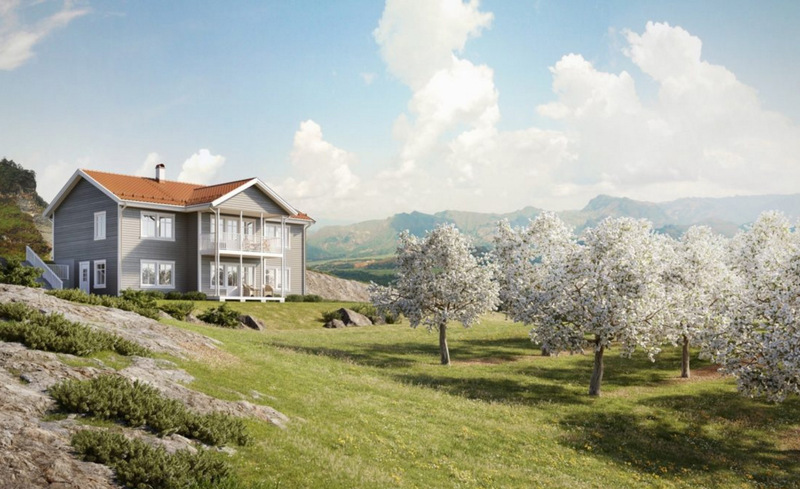 In the field of 3D visualization, the more finer details you apply to the image, the better the results. If you asked how we solved the third problem, you can see it for yourself by looking at the final outputs at the end of this article. The most important thing to remember is that if a client comes to you, you should become the master of your own field. Don’t allow the client to change your ideas on a half way; lead him instead. Otherwise, you will be put in a very funny situation. It’s like going to a dentist and telling him how to do his job. I know it’s a complete nonsense, but it always happens in our field. With Mood boards, the first thing you should do is to focus on general things like mood, illumination, colors, and the others. Later on, think about the finer details. Don’t leave this work for later. Think about it now so that you will be able to speed up your project development faster. You can see the output the client received below. Several tasks were not completed in full like the lack of stronger emotions we hoped to deliver, and that “wow” factor, in our opinion. Couple of images need more work and artistic touches. Just the thought that we weren‘t able to provide the best results did not let us sleep soundly for a few months. After several months of thinking over a half-baked project, we decided to redo it during our spare time to prove to ourselves that we can produce high quality results.We want to prove that we can do it and that we can work better if there are no interferences. Here are the results of our hard work and creativity, but at first little bit of information about Adirondack mountains. The Adirondack mountains are a series of mountains that form a massif in the northeastern New York State. 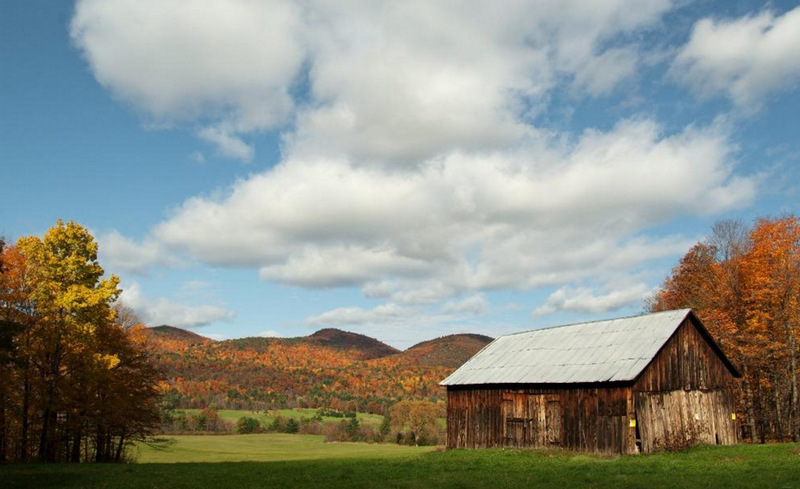 These mountains extend southward from Lake Champlain and St. Lawrence River valley to the Mohawk River valleys. The mountains are thinly spread and much of the massif’s area are still in its primitive natural state and is protected by the state law. The massif is covered with evergreen trees, pine forests, and hemlock with hardwoods interspersed on the lower slopes. The area is covered by glacial till which is the action of the glaciers retreating during the Ice Age. The mountains are ideal for different mountain activities, that is why a lot of state campsites, private resort villages, and parks are built around the area to offer facilities for swimming, camping, canoeing, and hiking. The Adirondack mountains offer a lot of opportunities for tourists who seek recreation and meditation. 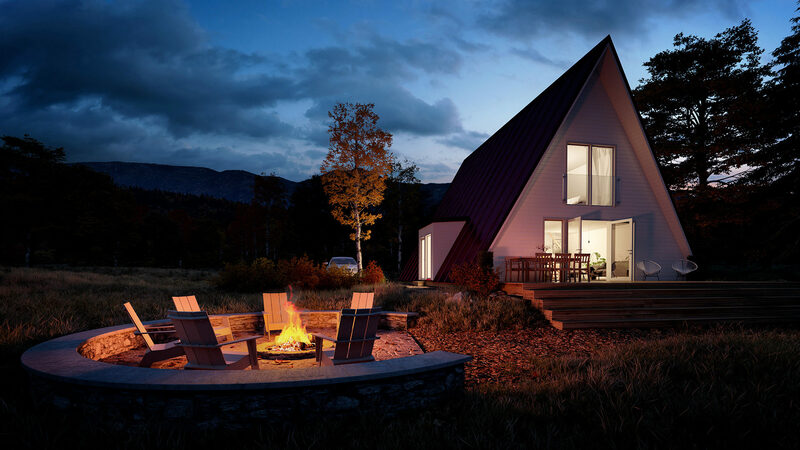 That is why having an own cabin in the Adirondack is perfect especially if the client wants to cherish and experience the beautiful scenery of the area. This project will help the client convince why having a cabin in the Adirondack mountains is an excellent choice. 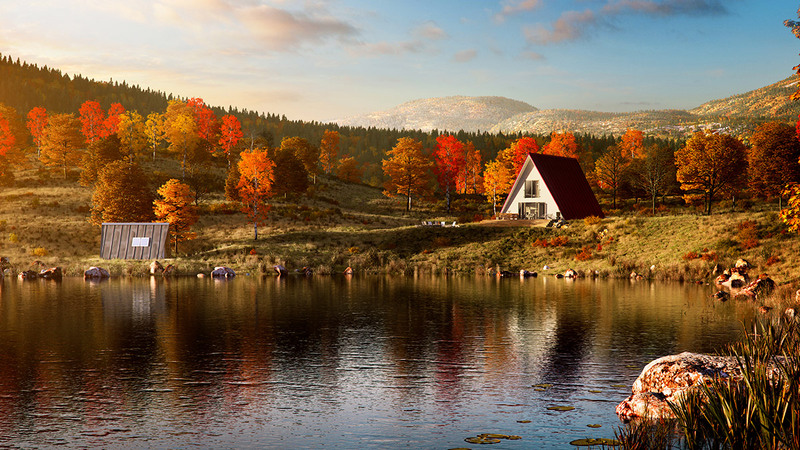 A captivating 3D render should contain an emotion that will trigger the people’s memory. 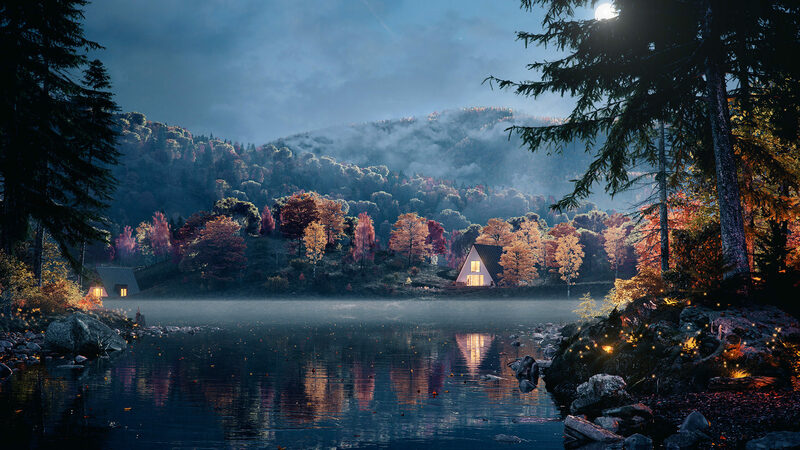 An excellent 3D render should possess the feeling of calmness in it. Pic 1: Just by looking at this image, you can feel a sense of calm and serenity. You can easily conclude that the place is very beautiful and peaceful. From the trees, land, water, and stone, everything is in harmony. If I want to live in a peaceful place, this would be a perfect choice. Pic 2: And at night, the scenery is just so beautiful. The moonlight reflects the waters and the fireflies light up the woods. The mountains covered with frost adds to its completely magical effect. Pic 3: At mornings fog covers the whole place, but the sunrise would uncover it which feels like unveiling a paradise hidden inside the woods. Pic 4: The beam of the sun lets the whole place shine and sparkle. Seeing it seems like the whole place is made of gold. Pic 5: Even the leaves falling into the ground looks mystifying. The wildflowers that bloom around the waters look so perfect and natural. Pic 6: And at sunset, a campfire will breathe into your soul as the moon greets you while the sun bids goodbye. If you want to have an excellent output, you have to create a stunning effect. Something that even your target customers would say “The emotions conveyed in this image are so vivid that I want to experience the place myself!” If this would happen, I’m sure that you have succeeded in your project. 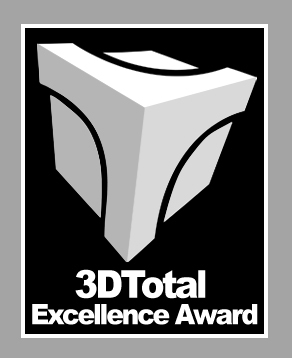 By the way, we just found out that with the latest images we got – a 3D Total Excellence Award. Also, our images will be printed in digital version of render.ru magazine. Now we can finally admit that we did our best with this project.